Antigone is a prime example of what Soup Can Theatre does best – taking classic theatrical stories and reinventing them for a modern audience to appreciate proving that the classics are timeless and ageless and can be relevant no matter what age you’re living in. Taking the original play by Greek playwright Sophocles translated by David Grene and setting it to modern day Toronto with the backdrop of the recent G20 protest and Occupy movements turns this production of Antigone into a Fringe show you cannot miss. The story begins with sisters Antigone and Ismene at an impasse during the G20 protest with armed guards closing in on them. There they discuss the fate of their two brothers Polyneices and Eteocles who lead opposite sides in the Thebes war and who have both died on the battlefield. The new king Creon has declared that Etocles will be the one honored while Polyneices will be left unhonoured and unburried in the battlefield. Antigone tries to convince Ismene to help her bury Polyneices but Ismene, afraid of the consequences, refuses. Antigone decides she will bury her brother anyway but gets caught in the process by Creon’s guards and is sentenced to death by being closed off in a cave, despite her betrothal to Creon’s son Haemon. The prophet Tiresias foretells that the Gods are on Antigone’s side and that Creon will lose one son if he does not release the girl, however it is too late and tragedy strikes. The acting in this performance is impeccable, the emotions high, the intensity thick and palpable. You can’t help but be drawn into the action on stage, your heart races as the plot draws to an apex. The scene of the guards dressed as police officers in black wearing gas masks closing in on Ismene bears painful reminder of the news footage of the G20 protests. It makes the show become that much more real. Great applause goes out to Cydney Penner’s performance as Antigone and Thomas Gough as Creon for their portrayals were simply outstanding. I was also equally impressed by the chorus, or guards, portrayed by Adriana Crivici, Daniel Kim, Heather Motut, and Aaron Rothermund not only for their amazing performances but for their use of body movement to create sculptures to help carry the story along, often done so in flashbacks to illustrate the scene. Excellent work! I can’t find many more words to describe this play except that it is breathtaking and, what I believe to be one of the best plays at the Fringe this year. While you’re checking out the festivities at the Fringe Club at Honest Ed’s, you owe it to yourself to head around the corner to the Randolph Theatre to see Antigone. Antigone plays at Venue 4 The Randolph Theatre (736 Bathurst Street). Show times are: July 8 at 1:15 pm, July 9 at 8:15 pm, July 10 at 1 pm, July 13 at 5:15 pm, and July 15 at 7 pm. 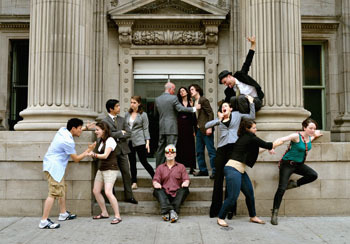 Photo of Daniel Kim, Heather Motut, John Chou, Chloe Payne, Michael McLeister (seated in foreground), Thomas Gough (standing in background), Kathryn Malek, Glyn Bowerman, Adriana Crivici (below), Aaron Rothermund (above), Leah Holder, and Cydney Penner by Scarlet O’Neil.